The Stealth 6 Visor Light Bar is even more powerful than the Stealth 4; it’s got 180 Watts of brilliant illumination produced by 60 Generation IV 3-Watt bulbs with a protective flashback shield. The 2-part light system, both driver and passenger sides, of the Stealth 6 form a wide, brilliant light span created by the polycarbonate, linear lenses. The visor light has 26 flash patterns: cycle, side by side, in and out, chasers, all, split and random. The bars also flash a steady 2 or 4 pattern meeting the Title 13 Requirement of California. A press of a button can make the lights flash from left to right, right to left, or center out. 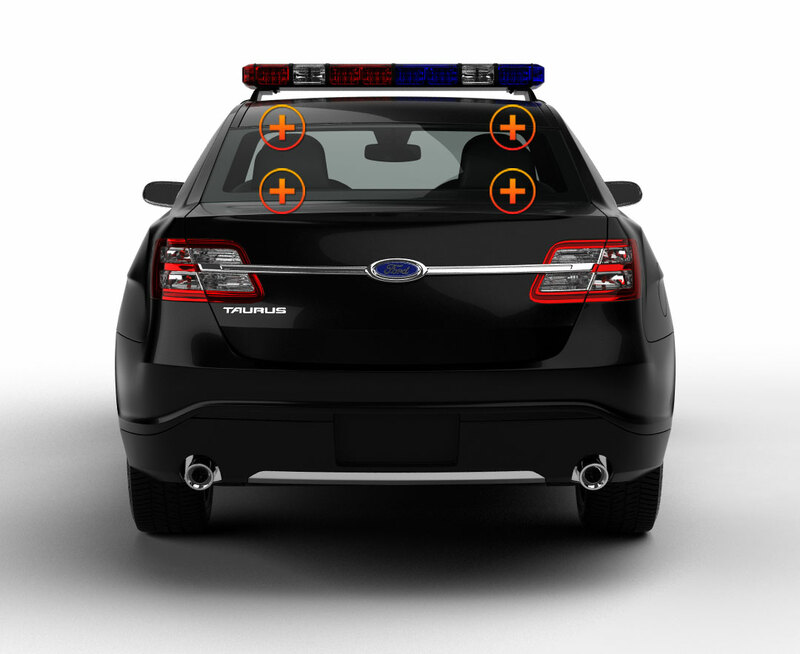 These emergency vehicle lights can tolerate high and low temperatures, but are not waterproof and are made for the interior of your vehicle. The power cord plugs into the lighter and has an On/OFF switch; for easy, quick access the main digital controls are located on the back of the system between the 2 bars. 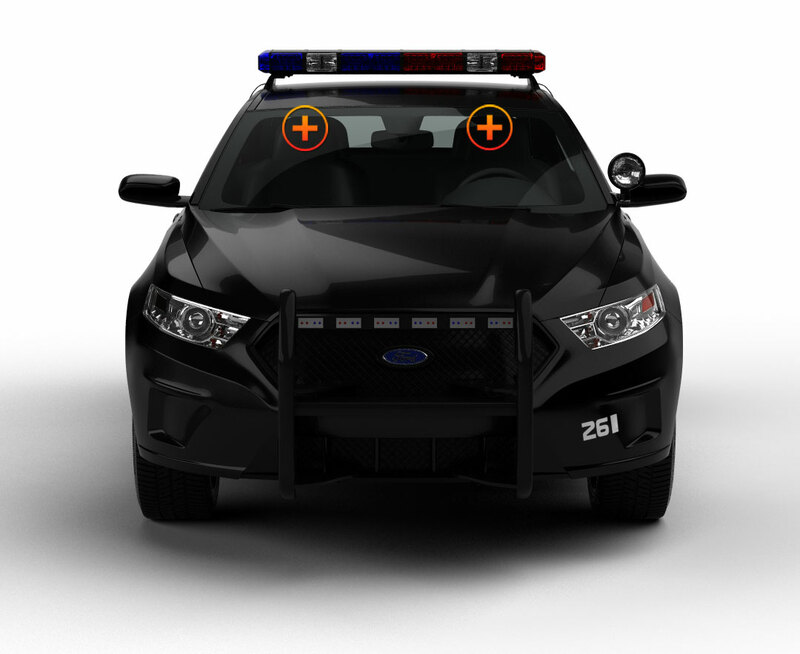 The 6 Visor Light Bar was originally made for the visor of police and emergency vehicles, but it can be fitted to the interior rear window as well. These light bars are attached with visor mount brackets by loosening the screws of the visor and slipping the clips behind them...there’s a great photo showing this in the Installation Guide. Installation takes about 5 to 10 minutes. Light for light this is an awesome light. I have no problem moving traffic with it. The light was easy to get installed, this light is BRIGHT! All and all, it's a really nice light. This Light is extremely bright. traffic out of the way quick. Well worth the investment. I recommend this light to anyone. This light bar is AWESOME!!! I put is beside of a light bar that cost several more hundred dollars and it was just as good. I have had no problems moving traffic running nothing but this bar even when not running a siren. I used the two ECHO E-24 Surface Mounts lights as rear deck lights. GREAT DEAL!!!!!!!!!!!!!!!! I bought it to replace what I had on my visors. This light bar is extremely bright. Can be seen in daylight easily. I am a volunteer firefighter and other Firefighters want to know where to get this light. I have told them. The awesome thing is that you get a good pair of E24s with it. The E24s are extremely bright as well. Bought this light, got it installed last week and love it. It is VERY bright and was not difficult to install at all. I did NOT have to cut or customize anything to get it to fit my Chevy Impala. It shows a little more than I wished for an undercover vehicle but is a very nice all around light. I would recommend it to anyone looking for an interior visor lightbar. I have received it installed it in less time then I thought it was going to take. I installed it in less than a half hour, for daytime lighting it is very bright. Just recieved my stealth visor 6 today, put it in with some minor easy fabrication in just under an hour by myself. Now I had a whelen freedom before this and wow what a difference. This throws brighter light than name brand. This is probably the brightest light I have ever seen. Whelen and Federal you better watch out, this is brighter and cheaper than anything else you will find. I will be doing business with ETD in the near future again. Thanks for a fantastic item! Also this went in the front of an 03 Ford Taurus. I would like to begin by saying the lights are awesome.... they are without a doubt blinding.....The mounting took a little adjusting but I was able to make them work with my TUNDRA. I recommend these lights to anyone and everyone. Will absolutely be buying more lights from this website in the near future. I'm giving this light bar 4 out of 5 stars only because it is not universal. It's probably made for chargers/impalas/crown vics/tahoes, but I had to jerry rig this light to make it fit in my 2003 Dodge Ram 1500. The brackets do not fit, and will not fit the sun visor. I ended up velcroing this light bar to my dash, and in the end I prefer it there. Little to no backflash while velcrode to the dash. Does not impair driving in the least. Only problem is you have to lean alittle further forward to change flash patterns. This is not a negative review, just giving information for those that may have the same model vehicle I have. Now onto the light itself. This light is BRIGHT!! Aside from it not being mountable in my model of truck (besides being tucked into the headliner)...this light is insanely bright. Great flash patterns. Great controls on the back of the bar. Worth the money, even if you mount it on your dash and not your visor. I would recommend this light bar to anybody. Just double check with the company if it is compatible with you year and model of vehicle. Bought this light and just installed today. VERY bright and not to difficult to install. I did have to cut/customize the visor brackets for my dodge nitro due to the fact the windshield is alot straighter than most cars. Very nice light all around and would recommed it to anyone looking for an interior visor lightbar.